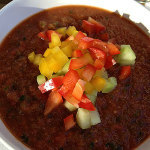 To set your soup apart serve with red and green peppers, cucumber all cut into small cubes to add at the table. 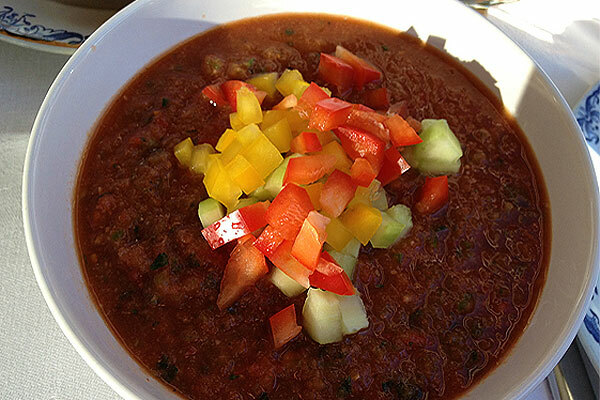 The king of Spanish soups Gazpacho uses the best of what summer has to offer. Tomatoes, cucumbers and fresh peppers. Chop up all the vegetables and put them into your food processor with the canned tomatoes. Process until it gets to a consistency that you like. I like mine a bit course. About 1 -1 1/2 minutes. Taste for salt and pepper. It can take quite a bit of salt. You may make it a little more spicy if you like but in Spain they don't use hot peppers. Pour the oil in while the machine is running to help it blend in and not separate later. Then add the bread (about the equivalent of 2 or 3 slices of bread). The bread is the thickener in this recipe. Take each of the left over peppers and the cucumber and cut them into small cubes as in the photo and place in individual serving bowls to put out when you serve the soup. People then take a spoonful of each one to sprinkle over their soup. This turns it into something a little more special and gives it a fresh and crunchy texture. You can use fresh tomatoes if you like but here in Sweden unless you grow your own, canned are better. You will also have to blanch and remove the skin before you process them. About 1 kilo or 2 pounds should do the job. The reason for the bread is that after the soup sits it will begin to separate. The water in the vegetables is released from the processing and will float to the top especially if you used fresh tomatoes.. To avoid that and to help give the soup some body a few pieces of bread are very helpful. I love this recipe and it's so easy. Make it in the morning for lunch or dinner and let it grow in the fridge. With some baguette or Italian bread it can become a whole meal in itself. I usually serve it for lunch or dinner with bread and cold meats like salami or Spanish dried sausages.